I’m curious why more people aren’t downloading this version, opposed to the first version. This version is quite a bit better, and I have another version that I’ve pondered releasing it. It’s far, far better with lots of customization opportunities. Perhaps I’ll release it yet. Simple Analog 2 (“Analog2”) is a rewrite of the Simple Analog application, thus it’s a brand new application. It will support iPhone/Touch with and without retina displays and also all versions of iPad including retina display models. Initially the day of the week and month view will be removed as many were finding faulty day rendering in the previous app. The current month, day and year are displayed in portrait views. Rotation has been completely repaired and is much more elegant. 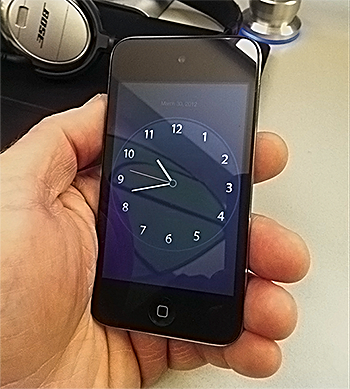 There is a single clock face display that is supported. A simple tap on the face presents the user with a dimming slider for the clock face itself… handy for turning everything except the hands down in a darkened room. Another tap and the control disappears. Settings are now application-based and reside in the Apple Settings.app. I’ve tested on numerous devices and the settings are indeed saved and used appropriately. It’s nice that the settings for the application are now out of the application itself. If you have ideas on what you need, let me know. I could bloat this application out based on my personal whims, but ultimately I am not the user. Version 1.0 almost painfully simple, but it serves it function accurately. I am secretly (not now, hehe) wondering if I\’ll get a rejection email in regards to my bundle ID. I won\’t make that mistake ever again, that\’s for sure. Love the design, love the simplicity. Perfect implementation of the screen dimming. The slider only dims the clock face, not the hands. Exactly what I need in a bedside clock. No more, no less. Many thanks for the awesome read.